A fundamental question in contemporary minimalist approaches to movement is why copies left by phrasal movement are not realized. Particularly puzzling from this perspective is the observation that pronouns, in a range of environments, appear to function as spell-outs of gaps (e.g. Zaenen et al. 1981; Koopman 1982, 1984; Sells 1984; Engdahl 1985; Pesetsky 1998; Boeckx 2003; Kandybowicz 2007; Holmberg and Nikanne 2008; Harizanov 2014; Sichel 2014), a phenomenon I refer to as pronoun copying. 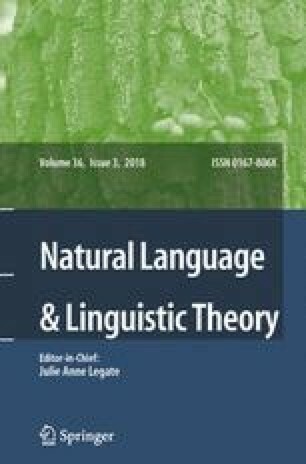 This paper first presents a novel pronoun copying pattern in the Nilotic language Dinka Bor, in which a 3rd person plural pronoun spells out intermediate copies at the verb phrase edge. I then show that Dinka pronoun copying displays two unusual number asymmetries that provide a unique insight into the link between pronoun copying and copy deletion: (i) the pronoun matches only in number, not person, and (ii) only plural DPs initiate copying. Importantly, this number sensitivity mirrors a general asymmetry in the expression of singular and plural. I argue that this parallel reveals that pronoun copying in Dinka reflects partial deletion in a DP copy, deleting everything but the structure that hosts number information. The availability of partial deletion in multiple copy spell-out is shown to follow from an approach to copy deletion based on economy, as developed by Landau (2006). In support of this, I demonstrate that Dinka’s asymmetries in fact have their counterparts across pronoun copying constructions and develop a unified account of pronoun copying crosslinguistically. A key claim of the Minimalist Program is that all structure-building arises by means of a single mechanism, Merge (Chomsky 1995). In this view, movement occurs when one of the inputs to Merge is a syntactic object already present in the structure, resulting in a copy. This idea is often referred to as the Copy Theory of Movement,1 and the claim that movement leaves a copy distinguishes the minimalist approach from most other syntactic theories, such as LFG, HPSG, or Categorial Grammar. A challenge in such a framework is that the copies left by phrasal movement do not seem to get realized, even though phrasal movement provides most of the motivation for the Copy Theory of Movement (Chomsky 1995:ch. 3, Sect. 3.5). These constructions are found in a wide variety of languages (for an overview, see Kandybowicz 2007:80, for example), and offer support for a copy theory. In addition, there is one type of multiple spell-out that is consistently found with movement of DPs. In a wide range of constructions, pronouns appear to be able to mark positions in a movement chain. Such phenomena have been documented in at least resumption (2a) (e.g. Zaenen et al. 1981; Engdahl 1982, 1985; Boeckx 2003; McCloskey 2006; Kandybowicz 2007; Sichel 2014), wh-copying constructions (2b) (e.g. Fanselow and Mahajan 2000; Felser 2004; Bruening 2006; Pankau 2013), clitic doubling (2c) (e.g. Anagnostopoulou 2003; Harizanov 2014; Kramer 2014), and subject doubling (2d) (e.g. Van Craenenbroeck and Van Koppen 2002; Holmberg and Nikanne 2008). I refer to such constructions as pronoun copying. The question that arises then is what approach to copy deletion can explain both why copy deletion is often obligatory and why, in cases of apparent multiple spell-out, we find the constructions in (1a–c) and (2a–d). Nunes (1995, 2004) provides an influential account of copy deletion that proposes deletion is necessary to avoid conflicts in the linearization algorithm at PF. This model also offers a route to multiple copy spell-out, on the assumption that copies that are heads may exempt themselves from this calculus through adjunction or cliticization to another head. Such an approach derives verb copying as well as patterns of pronoun copying in which both copies are pronouns, such as (2b–c). A problem for a linearization-based approach to pronoun copying, however, is that there are pronoun copying constructions in which pronouns spell out copies of full lexical DPs, such as (2a) and (2d). In addition, not all patterns of pronoun copying display clear evidence of cliticization. In this paper, I present novel evidence for the view that pronouns may spell out DP copies, even of full lexical DPs, from the Nilotic language Dinka (South Sudan). Using data from the Bor dialect, I show that long-distance movement of plural nominals in Dinka requires that the third person plural pronoun ké(ek) appear at each intervening vP edge, a phenomenon I call ké-copying. As a result, movement of a plural DP leaves a trail of plural pronouns all the way to the gap site (3a–b). I will present evidence that, in such examples, the pronoun ké represents the spell-out of a fully articulated copy of the moved phrase in an intermediate Spec-vP position. We will see that the dependencies in (3a–b) are indistinguishable from other movements in Dinka, in that they are island-sensitive and compatible with reconstruction, and that the plural pronouns occupy the position of an intermediate copy. This means that, like the cases in (2a) and (2d), the pattern in (3a–b) is a construction in which pronouns spell out copies of full lexical DPs. In addition, we will see that the copied pronoun is not a clitic and occupies a phrasal position, showing that multiple copy spell-out does not need to involve head-adjunction, contra Nunes (1995, 2004; cf. Harizanov 2014; Baker and Kramer 2016). On this basis, I argue for an approach to copy deletion based on economy, as developed by Landau (2006), in which copy deletion is driven by a pressure to pronounce as little as possible at PF. Such an analysis allows for multiple copy spell-out, if there are PF requirements that prevent deletion. As Landau shows, this view can derive the cases of verb copying in (1a–c). In this paper, I demonstrate that an economy approach can also deliver a unified account of pronoun copying, and the mechanisms by which a pronoun can spell out a copy of a full lexical DP. In particular, an economy view of multiple spell-out predicts that the secondary copy must undergo partial deletion if possible, because this will maximize deletion. If we adopt a view of pronouns that treats them as the realization of a DP without a lexical noun (e.g. Postal 1969; Elbourne 2001, 2005), partial deletion of a DP can yield a pronoun (e.g. McCloskey 2006). A key contribution of this paper is to show that pronoun copying patterns crosslinguistically display two properties that derive from the application of partial deletion, both of which are found in Dinka ké-copying. Specifically, ké-copying displays two asymmetries based on number that I suggest are revealing of the mechanism by which pronouns spell out a DP copy with a richer structure. The first way in which this manifests itself is that copied pronouns in Dinka display a person mismatch effect. 1st and 2nd person pronouns must be copied by the 3rd person plural pronoun instead of an identical pronoun (4a–b). In addition, pronoun copying in Dinka has a systematic gap. Only plural DPs trigger copying, while movement of a singular DP cannot be accompanied by a singular pronoun (5a–b). These effects turn out to mirror a general morphological asymmetry between singular and plural in Dinka. Plurality in Dinka has a consistent cross-paradigmatic spell-out, k(e), while singular is marked in different ways in each paradigm. I argue that this is at work in the form of the 3rd person plural pronoun as well, which I propose is a realization of [plural] only, unlike all other Dinka pronouns. This view of plurality in Dinka captures the number asymmetries in ké-copying through the mechanism of partial deletion: pronoun copying involves only the realization of the part of the copy that encodes number. This explains the person mismatch (person is part of the structure that is deleted), and the lack of copying with singulars (there is no Dinka pronoun that realizes just [singular]). These Dinka facts then provide novel evidence that the content of a copy may be expressed selectively. In addition, we will see that gaps and person mismatches are not just found in Dinka, but appear in resumption, subject doubling, and wh-copying as well, in Nupe, Finnish, dialects of Dutch, and German, respectively (Kandybowicz 2007; Holmberg and Nikanne 2008; Van Craenenbroeck and Van Koppen 2002; Pankau 2013). On this basis, I argue that all pronoun copying arises by the same mechanism, partial deletion. I present a unified approach to pronoun copying, in which the workings of the copy deletion mechanism is uniform across languages, but may yield pronoun copying if a certain set of conditions are met. Specifically, I demonstrate that, in a partial deletion approach, variation in copying can be captured by appealing only to variation in (i) the distribution of independent PF requirements, (ii) spell-out rules for pronouns and (iii) whether certain functional heads delimit a phase. The paper is organized as follows. Section 2 introduces the phenomenon of ké-copying in Dinka and provides evidence that this pattern comes about because an intermediate copy of successive-cyclic movement through vP is realized as a pronoun. In Sect. 3, I show that pronoun copying in Dinka displays a gap with singulars as well as a person mismatch. I demonstrate that this sensitivity to plural has a parallel in a general morphological asymmetry between singular and plural in Dinka. On the basis of this, Sect. 4 develops a partial deletion approach to pronoun copying, drawing on Landau’s (2006) proposal that copy deletion is driven by economy. In Sect. 5, I show that the person mismatch and the existence of a gap can be found across constructions in which pronouns appear to spell out a gap, and argue on this basis for a unified treatment of these constructions. The picture that emerges is one in which a pronoun can in principle spell out any copy in a movement chain and is not limited to any particular syntactic configuration or construction. Aside from its consequences for the treatment of pronouns and pronoun copying constructions, this paper functions as an additional argument for successive-cyclic derivations and for the Copy Theory of Movement (Chomsky 1995 et seq.). Because it requires that movement leave copies with an articulated internal structure, the proposal I outline favors an analysis of movement with copies over other ways of modeling long-distance dependencies, such as feature percolation (e.g. Gazdar 1981; Bouma et al. 2001; Neeleman and Van de Koot 2010), or movement with traces (Chomsky 1981). My treatment of pronoun copying also provides evidence that features like person and number are hosted on separate projections in the nominal domain and offers insight into how these are organized relative to each other. This section introduces the phenomenon of ké-copying in Dinka Bor, a diagnostic of intermediate movement to the vP edge identified by Van Urk and Richards (2015). In Dinka, long-distance movement of a plural noun phrase is always accompanied by the appearance of the 3rd person plural pronoun ké(ek) at the edge of each verb phrase on the path of movement. I present evidence that ké-copying results from the spell-out of an intermediate copy. This effect provides novel evidence for the claim that pronouns may act as the spell-out of a gap (e.g. Zaenen et al. 1981; Koopman 1982, 1984; Sells 1984; Engdahl 1985; Pesetsky 1998; Boeckx 2003; Kandybowicz 2007; Holmberg and Nikanne 2008; Harizanov 2014; Sichel 2014). Dinka is a Nilotic language, spoken in South Sudan. All the data in this paper comes from fieldwork on the Bor dialect. We will see that Dinka has a V2 effect both at the edge of the clause and at the edge of the verb phrase. I focus mainly on V2 in the vP, which I will hold responsible for ké-copying. The main focus of this paper, however, is on a V2 effect found in the Dinka verb phrase, which mirrors the V2 effect at the clause edge. In the verb phrase, the highest object must be initial. The verb phrase edge is diagnosed by the position of the lexical verb when it does not move to second position. In (7a), the future auxiliary b Open image in new window occupies 2nd position and so the non-finite verb t Open image in new window iŋ (‘see’) is in its base position. We see now that the in situ verb must be preceded by the DP object mìir (‘giraffe’) (7a–b). This is a V2 effect, because the object occupies a derived position. In sentences with multiple auxiliaries, lower auxiliaries are also non-finite and accompany the main verb (8a).4 The object must still appear initially in the verb phrase (8a–b), revealing that it is not in its thematic position. In addition to this, all other objects and adjuncts must appear after the main verb. In a ditransitive, either object may appear before the main verb (9a–b), as long as the other object and any adjuncts follow it. Note that this V2 effect ignores subjects. Following Van Urk and Richards (2015) and Van Urk (2015), I propose that we can understand this V2 requirement in featural terms. V2 is established by a φ-probe on v, which agrees with the object and attracts it to Spec-vP, as in (10).5 For the sake of concreteness, we can think of this φ-probe as having an EPP subfeature (e.g. Pesetsky and Torrego 2001), which drives Internal Merge. As Van Urk and Richards describe, the V2 requirements of C and v are also satisfied by successive-cyclic movement. Moving an object out of a ditransitive, for instance, requires first moving that object to Spec-vP (11a–d), obligatorily satisfying V2 there. These facts also provide evidence that vP is a phase, as in Chomsky (1986 et seq. ), and that Spec-vP functions as an escape hatch position.7 The most striking piece of evidence for the role of Spec-vP in long-distance movement in Dinka comes from a different effect, however, the process of ké-copying, which I turn to now. Intermediate movement in Dinka is also associated with a multiple copy spell-out effect. Movement of a plural DP in Dinka triggers the appearance of the 3rd person plural pronoun ké(ek) at the edge of each vP on the path of movement. This happens with all instances of long-distance movement, including topicalization, as in (12a), relativization, as in (12b), or the wh-cleft in (12c).8 As evident in (12a–c), ké-copying is found with all types of DP, whether pronouns or lexical DPs. Pronoun copying happens successively in cases of long-distance extraction. A copied 3rd person plural pronoun appears at every vP edge on the path of movement, as the examples in (14a–b) demonstrate. I refer to this phenomenon as ké-copying. I will argue that it reflects the realization of an intermediate copy left by successive-cyclic movement in Spec-vP, and is driven by the V2 property of v. In other words, for an example like (15), ké-copying involves the configuration in (16). Importantly, this means that copied ké functions as the spell-out of a lexical DP, like Open image in new window (‘which people’) in the tree above. In the rest of this section, I motivate the different aspects of the multiple copy spell-out analysis in (16), starting with the proposal that ké-copying involves copying of a pronoun. Like all Dinka pronouns, the third person plural pronoun has a full version (kêek) and a phonologically reduced form (ké), with a short vowel and no coda consonant (17a–b). Although the full form appears to convey some emphasis, these pronouns can be used interchangeably in most instances. Both can be coordinated, for instance (18a–b) (cf. Cardinaletti and Starke 1999; Déchaine and Wiltschko 2002). We see the same variation in pronoun copying, so that both the reduced and full form may accompany any particular instance of movement (19a–d), without any apparent difference in interpretation. This variation extends to long-distance movement. With multiple instances of ké-copying, any of them may appear as the full form of the pronoun, apparently without constraints (20a–c). This similarity in form suggests that copied ké(ek) is an instance of the 3rd person plural pronoun. In addition, it suggests that copied ké(ek) is not a clitic. Dinka is an overwhelmingly monosyllabic language. Most lexical roots are limited to a C(G)V(V)C template (where G = glide), permitting one vowel length contrast in their inflectional paradigm. As a result, copied ké is no more reduced in form then than many lexical nouns, verbs, and adjectives.11 All true affixes, for example, lack a coda consonant (as evident in the paradigms in Sect. 3.2). That copied ké is not a clitic is also evident in the fact that it is free-standing, like regular pronouns. Copied ké often immediately precedes the verb, as in (21a). This does not have to be the case, however. Copied ké can surface also before an object in Spec-vP when a plural adjunct moves out of the vP (21b). In fact, copied ké can be followed by nothing at all, when the verb moves to 2nd position (21c). These facts demonstrate that ké is free-standing and not associated with the verb. Ké is not the realization of a functional head in the extended projection of the verb, and is not cliticized onto one, because then it should move along with the verb when the verb moves into the left periphery. Instead, its position simply reflects the position of a specifier of v. The fact that copied ké is a non-clitic element is an important one, because it is one of the conclusions that favor the partial deletion analysis I will develop over an alternative in which multiple copy spell-out with DPs is driven by cliticization (e.g. Nunes 1995, 2004; Harizanov 2014; Kramer 2014; Baker and Kramer 2016). Like objects, such modifiers trigger successive ké-copying when undergoing long-distance movement, as the examples in (23a–b) attest. Importantly, the only plural phrases that do not trigger ké-copying with Ā-movement within a clause are subjects. A plural subject in Spec-CP, for example, cannot be doubled by a copied ké (25a). Similarly, relativization of a subject may not be accompanied by ké-copying (25b). These facts show that ké-copying is linked to the V2 requirement of v. As mentioned in Sect. 2.1, subjects do not count for vP-level V2 in Dinka, presumably because they do not enter into an Agree relation with v.
This contrast follows if ké-copying reflects intermediate movement to Spec-vP. Subjects are not in the domain of verb phrase V2 and so movement out of a subject should not require stopping off at its vP edge. We can conclude from these facts that ké-copying is a consequence of intermediate movement to the edge of the verb phrase. As noted also by Van Urk and Richards (2015), ké-copying then functions as additional evidence for successive-cyclic derivations through vP edges (Chomsky 1986 et seq.). Let me now provide arguments for the claim that dependencies with ké-copying involve movement. It is important to show, first of all, that dependencies with ké-copying behave like all other instances of movement in Dinka. Because ké-copying is limited to plurals, we can compare movement with ké-copying to movement without it, by comparing movement of a plural to a movement of a singular. First of all, as already noted, all movement, accompanied by ké-copying or not, satisfies the V2 property of intervening CP and vP edges, providing evidence for a successive-cyclic derivation. In addition, as the examples in (28a–b) demonstrate, all movement, whether accompanied by ké-copying or not, is sensitive to islands. In further support of the idea that the syntax of movement is the same regardless of whether ké-copying takes place, observe that whether movement reconstructs is independent of ké-copying. Using Dinka’s Condition A anaphor, movement can be shown to reconstruct for local (29a), long-distance (29b), and intermediate binding (29c). There is no discernible effect of ké-copying then on the interpretation of long-distance movement. This follows if copied ké simply diagnoses the location of an intermediate copy of successive-cyclic movement. This is the only instance in which two DPs appear at the left edge of the verb phrase in Dinka (setting aside the subject, which does not count for the calculus of V2). Dinka does not allow other nominals, adjuncts, or adverbs to surface in between an in situ subject and an object in Spec-vP. As a result of this, there is a clear contrast between copied and independent instances of ké(ek). Independent uses of the third person plural pronoun obey the V2 restriction: they may only appear at the vP edge by themselves (32a), and not alongside another object (32b). The position of copied ké in such examples also functions as an argument against an approach that takes it to be a clitic or a functional head, because it shows that copied ké does not surface in the position of v, but on the edge of that projection. In contrast, the facts represented in (33) follow if copied ké is the spell-out of a copy, because its position then directly reflects the position of the outer specifier of v.
I conclude then that ké-copying in Dinka is the realization of a copy left by intermediate successive-cyclic movement to the vP edge. In this way, Dinka provides novel evidence that pronouns can mark positions in a movement dependency and act as realizations of gaps (e.g. Zaenen et al. 1981; Koopman 1982, 1984; Sells 1984; Engdahl 1985; Pesetsky 1998; Kandybowicz 2007; Holmberg and Nikanne 2008; Harizanov 2014; Sichel 2014). Importantly, this type of construction cannot be captured by an approach to multiple copy spell-out along the lines of Nunes (1995, 2004). First of all, ké-copying occurs with complex DPs as well as pronouns. In addition, copied ké does not behave like a clitic or an adjoined head. As with other constructions of this type, the question arises then how a pronoun can be created from a DP copy, which may be complex and contain all sorts of additional material. In the rest of paper, I show that ké-copying displays two unusual asymmetries based on number that offer a unique insight into the mechanisms behind pronoun copying. In particular, we will see that ké-copying’s unusual sensitivity to plurality receives a straightforward explanation if pronoun copying arises through partial deletion. In this section, I show that ké-copying has an unusual sensitivity to plurality, which expresses itself in two asymmetries. First, pronoun copying in Dinka shows a gap with singulars, as already discussed. In addition to this, ké-copying only matches the antecedent DP in number, and systematically displays a person mismatch. These asymmetries mirror a general asymmetry between singular and plural in Dinka, also evident in the pronoun paradigm: plurality is consistently marked in the same way across paradigms, with the morpheme k(e). In contrast, there is no cross-paradigmatic marking for singular. I will later argue that two asymmetries provide an important clue for the proper analysis of pronoun copying. In particular, we will see that these asymmetries can be captured in an account that treats ké-copying as the realization of only the subpart of a copy that expresses number. A key characteristic of Dinka pronoun copying is its sensitivity to plurality. As previously mentioned, for example, movement of a singular DP never triggers copying (34a–b). I will refer to a restriction of this type, in which only a subset of possible antecedents trigger pronoun copying, as a gap. We will later see, in Sect. 5.2, that gaps can be found in other pronoun copying constructions as well. The second number-related asymmetry found in Dinka pronoun copying is that the copied pronoun only matches the moved DP in number, and not in person. We see this when a 1st or 2nd person plural pronoun is topicalized across the vP edge. Pronoun copying is still triggered, but it is the third person plural pronoun ké(ek) that appears (35a–b). Using a copied pronoun with matching person features is impossible (36a–b). 1st and 2nd person plural pronouns pattern like 3rd person plural nominals in every respect for ké-copying. As a further illustration of this, we see that long-distance movement of these pronouns triggers pronoun copying at each edge (37a–b). If third person is the default value for person, this shows that ké-copying only displays matching in number. I refer to this asymmetry as a person mismatch, and we will see that, like gaps in pronoun copying, this asymmetry too can be found across pronoun copying constructions (Sect. 5.1). These asymmetries are unexpected, and provide an important clue as to the mechanism that allows a pronoun to realize a DP copy. In particular, I show in the next section that they mirror a general morphological asymmetry between singular and plural in Dinka, which points to a partial deletion account. Ké-copying’s sensitivity to plurality parallels a general proclivity in the language for the signaling of plurality. The same morpheme, k(e), functions as plural inflection in a range of morphosyntactic environments. In contrast, although some paradigms have a regular way of marking singular, none of these have predictable cross-paradigmatic uses. I capture this by proposing that the morpheme k(e) is a general spell-out of plural, unspecified for morphosyntactic context. I then argue that this allows us to understand why the pronoun ké(ek) might differ from Dinka’s other pronouns. The 3rd person plural pronoun is the only pronoun that can be analyzed as a pure expression of number, with no overt person morpheme. Let me first motivate the idea that k(e) is a general plural marker in Dinka, employed across a variety of paradigms. The first of these paradigms concerns an agreement prefix I will refer to as the declarative or interrogative particle. This prefix appears on the second position verb/auxiliary and expresses φ-agreement with the nominal that satisfies clause-level V2 (38a–b). One of the regularities in this paradigm is that, in the past tense, plural is always expressed by the prefix kè, which comes after the past tense prefix. This is the only regular process of inflection marking number, though there are some irregular ways of distinguishing singular and plural, such as the contrast between à- and áa- in the declarative present. The morpheme k(e) also appears in the pronominal paradigm. In free-standing pronouns, plural is marked with a final -k, as highlighted in the paradigm for pronouns in the absolutive case in (41). This final consonant stands in opposition to the final -n found with singular pronouns. Although this final -n is regular, it differs from k(e) in that it appears only in this paradigm. The plural morpheme k(e) also appears with pronominal possessors. In Dinka, possessor enclitics agree in number with the possessum, which is expressed in the initial consonant (42a–b). All possessor clitics take the prefix d- with singular nouns and k- with plural nouns (43). Again, we see that k(e) does work as a regular plural morpheme. The only apparent exception, the 1st person singular enclitic with plural agreement, ci Open image in new window , is the result of a palatalization rule targeting ki sequences found in the Bor dialect, and the Agar dialect as well (Andersen 2002:17). In other dialects, such as Nyaarweng, this rule is not found and the enclitic is -ki Open image in new window . Dinka has a third pronominal paradigm, for subject clitics that attach to the 2nd position verb or auxiliary. These pronominal clitics are used whenever a pronominal subject is not in clause-initial position (44a–c). These clitics affect the second position verb/auxiliary by triggering a number of different allomorphy effects (Andersen 1993). The verb nhiέεr in (44b), for example, becomes nhíar in (44c) when followed by the 1st person plural enclitic -k Open image in new window .20 Singular clitics are marked solely by such changes to the root. I will not cover this system in detail in here, but see Andersen (1993) for an extensive overview. What it is important for our purposes is that all the plural forms involve an enclitic with an initial k-, as illustrated in (45) and (46). Another set of items with plural and singular inflection is Dinka’s enclitic demonstratives. Dinka has a distal and wh-demonstrative, as well as two demonstratives encoding proximity to the speaker or addressee (Andersen 2016:656). Like the possessors, these display number agreement. There is no consistent way of marking singular agreement in these forms, but the plural is always formed by adding an initial k-, either directly to the singular base or substituting for the initial consonant (47). There is a clear morphological asymmetry then between singular and plural in Dinka. None of the five paradigms described here mark singular in the same way. Not all of them even have regular singular inflection. In contrast, plural consistently uses the same inflection. There is no regular marking for plural in any of these paradigms that does not involve k(e). It is important to note that, outside of these paradigms, there are instances in which plural is not marked by k(e). In the examples presented above, we can already see this in the present tense paradigm of the declarative particle and in the possessor clitics. The present tense declarative paradigm, for instance, marks the opposition between 3rd person singular and plural by a change in vowel length and in tone (à vs. áa). Similarly, the distinction between singular and plural possessors is marked by unpredictable differences in the vowel and coda (e.g. 3sg -kè vs. 3pl -kέεn, in plural nouns). A much bigger pool of variation is found with Dinka nouns, which have been claimed to only have irregular plural marking (Ladd et al. 2009; Andersen 2014). Almost all Dinka nouns pluralize by changes to the root, either in tone, length, voice, or vowel quality. Some example pairs for a number of nouns are given in (48). In detailed studies of Dinka plurals, Ladd et al. (2009) and Andersen (2014) conclude that the number of a noun cannot be deduced from its phonological form. Whether this conclusion is right does not matter for our purposes, but it could mean that k(e) represents the only regular form of plural inflection in Dinka. The singular-plural asymmetry described above mirrors the sensitivity to plural found in ké-copying, in which it is also only plural that is associated with a regular realization. It is this parallel that will motivate my treatment of ké-copying. I will suggest that the rule in (49) allows us to understand what makes the 3rd person plural pronoun ké different from all other pronouns. The structure in (50) also fits well with Harbour (2016), whose theory of possible pronoun inventories across languages requires that person be introduced below number. I identify Pers as n because it keeps the structure of pronouns and DPs minimally distinct and consonant with the view that pronouns realize DPs without a noun (Postal 1969; Elbourne 2001, 2005). I will also later suggest that the projection that contributes person in pronouns may in some languages be phasal, and identifying it as n allows us to keep the inventory of phase heads restricted. The account I develop is also consistent, however, with a view in which the pronoun root is a functional head unique to pronouns, as long as it has the same phasal properties across languages. What is crucial for my approach is that these structures put the locus of number above person in pronouns. Another argument for this comes from the observation that, when pronouns can be decomposed into person and number, number affixes appear to come between person and case affixes.25 In Turkish, for instance, the plural suffix -laɾ/-leɾ is used to form the 3rd person plural pronoun and comes between the suppletive 3rd person form on and case suffixes (52a). A similar pattern is found in Kayardild (52b). Now that we have motivated a syntactic structure for pronouns, consider again the inventory of Dinka pronouns in (53). As previously mentioned, all Dinka pronouns consist of two morphemes. At their core is a CV morpheme that expresses both person and number. This morpheme can also appear in isolation and function as the short form of the pronoun, like ké does. In addition, all Dinka pronouns may appear with a final consonant, -k or -n, which marks just number. I suggest that the make-up of the 3rd person plural pronoun diverges from (54a–b), which will ultimately account for the ké-copying effect. Observe that the 3rd plural pronoun is unique in that both the initial CV and the final C have the form of Dinka’s general plural morpheme k(e). I suggest that this morphological similarity is revealing of a structural difference, namely that the 3rd person plural pronoun expresses only plurality. In this analysis, the 3rd person plural pronoun is just the general morpheme for plurality, ke, so that there is no overt expression of person in the pronoun at all. I propose that the full form kêek is another allomorph of [plural], used to satisfy the CVVC template for full pronouns. This view treats the alternation between the short and full form of the pronoun as a templatic one,27 which aligns well with the observation that there is no apparent syntactic or semantic difference between the two forms, as previously noted in Sect. 2.3.28 The 3rd person plural pronoun is then the product of a set of spell-out rules like (56a), and has the structure in (56b). If correct, this approach means that there is an asymmetry in the pronoun inventory between the 3rd person plural pronoun and the other pronouns which mirrors the asymmetry between singular and plural across the language. In the next section, I show that this idea provides an explanation of the number sensitivity of ké-copying, if copied ké realizes only the number part of a copy, through the application of partial deletion. This section develops a partial deletion approach to pronoun copying. We have seen so far that ké-copying provides evidence that there are patterns of multiple copy spell-out in which non-clitic pronouns can realize a copy of a full lexical DP. In addition, as we will see in Sect. 5, such constructions are not unique to Dinka. I will now show that an approach to copy deletion based on economy constraints, as in Landau (2006), provides a model of multiple copy spell-out that also predicts pronoun copying, because it forces partial deletion in contexts like ké-copying. If pronouns represent DPs without a noun, as in Postal (1969) and Elbourne (2001, 2005), such an approach predicts pronoun copying. In addition, a partial deletion analysis offers insight into the number asymmetries found in Dinka. If partial deletion removes everything but the NumP and KP layer of a copy, only ké(ek) will be able to surface, under the assumption that only the 3rd person plural pronoun is capable of realizing only number. Patterns like ké-copying appear to require an analysis in which copy deletion is not tied to linearization conflicts, as in Nunes’s (1995, 2004) influential approach. This is necessary because the Dinka pronoun copying pattern does not involve cliticization, but rather non-reduced pronouns, which requires that multiple copy spell-out is possible without reducing additional copies to a head. In addition, ké-copying, like other patterns of pronoun copying I will discuss in Sect. 5, involves copies of complex DPs. Instead, I adopt Landau’s (2006) proposal that copy deletion is driven by economy constraints at PF. An advantage of this economy approach is that it provides a mechanism by which a copy of a lexical DP is reduced in the context of multiple spell-out, by forcing partial deletion in such instances. In this section, I develop this approach and outline the conditions under which it should give rise to pronoun copying. Importantly, the principle of P-Recoverability also allows for multiple copy spell-out, by means of the notion of “association with phonetic content.” Landau’s definition of this is given in (60). I propose that the V2 property of v/C in V2 languages may function as a PF requirement in the sense of (60b). I adopt a phonological approach to EPP effects, as in Richards (2001, 2016), Boeckx (2003), and Landau (2007). To be precise, I posit that a feature with an EPP property functions as a spell-out instruction, in the sense of Richards (2001, 2016). As a result, phrases that Agree with v for an Ā-feature or φ-features in Dinka are in a position of the type in (60b), a position that requires realization.32 It will then force multiple copy spell-out under Landau’s P-Recoverability principle. That the EPP property of a head can force multiple spell-out is also evident in languages like Vata and Nupe, in which movement of a subject requires spell-out of a resumptive pronoun in the gap position (61a–b) (Koopman 1982; Kandybowicz 2007). One question that arises in this type of approach is why not all EPP positions trigger multiple copy spell-out. This issue is particularly pertinent in Dinka, because there is no comparable ké-copying effect at the CP edge, even though it also has a V2 effect. I return to this problem in the Sect. 4.4, and suggest that there may be multiple responses to the problem of copy deletion in an EPP position, again drawing on Richards (2001) and Boeckx (2003). I will now show that an economy-based analysis predicts that additional copies in multiple spell-out must be minimal in form, much like a linearization-based approach. In particular, Economy of Pronunciation predicts that, if possible, such secondary copies must undergo partial deletion, because deletion in this instance will not violate P-Recoverability. I argue that this partial deletion operation is what gives rise to pronoun copying across languages. In Nunes’s (1995, 2004) model, multiple copy spell-out is possible when a copy undergoes adjunction to another head, allowing it to avoid a linearization conflict. This works well for cases of verb copying, since the copies involved are all heads. An economy approach deals with such examples in the same way, except it treats the PF requirements that are often associated with head-adjunction to be responsible for spell-out. The two approaches deal differently with instances of multiple copy spell-out that target a multi-word phrase, such as a complex DP. A linearization-based approach does not allow multiple spell-out in such cases, since phrases cannot undergo head-adjunction.33 An economy approach, in contrast, in principle allows multiple spell-out of phrases, as long as each phrase is associated with a unique PF requirement, such as the EPP. However, Economy of Pronunciation does not make the prediction that multiple phrasal copies should be realized intact, because of the possibility of partial deletion. P-Recoverability is satisfied as long as one phrasal copy is faithfully realized, but it allows for some of the material in other phrasal copies to be deleted, as long as a prosodic unit remains that is capable of satisfying the phonological requirement driving multiple copy spell-out. In fact, Economy of Pronuncation should render this obligatory, because it maximizes deletion. In this way, an economy approach allows for multiple copy spell-out with phrasal copies, but limits additional copies to a “minimal” form, or a single prosodic word.34 It is this difference between heads and phrases that I will hold responsible for the asymmetry between nouns and verbs that is apparent when we compare most instances of verb copying and pronoun copying: verbs usually copy as verbs, but DPs only copy as pronouns. I suggest that what unifies these is that they represent the most minimal form a verb or DP can take in compliance with Economy of Pronunciation. With this logic in mind, let us consider how a pronoun could be created from a full phrasal copy of a lexical DP. As in work by Postal (1969) and Elbourne (2001, 2005), I take it that pronouns are the realizations of DPs without a noun complement. This means that the structure I adopt for lexical DPs is in (62). The structure of pronouns I adopted in Sect. 3.3 is in (63). If these structures are correct, then partial deletion of a DP like (62) will always end up with a structure that is fully shared with pronouns. If pronouns represent the morphological realization of functional DP structure in the absence of a noun root (Postal 1969; Elbourne 2001, 2005), this means partial deletion will create a pronoun. The simplest option is to assume that partial deletion always removes everything but the highest head, K. I will end up pursuing a slightly different proposal, but let me first show how this approach would work. In this view, spell-out of K is what yields a copied pronoun, with all other material inside the DP copy deleted. In addition, this mechanism delivers pronoun copying without requiring head-adjunction, allowing secondary copies to occupy phrasal positions. A limitation of this approach, however, is that copied pronouns seem to preserve information that is encoded below K. In Dinka, copied ké expresses plurality still, so that we need this information to be present in the copied pronoun also. In fact, all pronoun copying constructions discussed in Sect. 5 preserve number, and some express person as well. As we will see, an apparent generalization across pronoun copying patterns is that number may be preserved without person, while person cannot be preserved without number (64). I suggest that the generalization in (64) should derive from the way in which person and number information is organized inside a DP, and specifically from the idea that number is introduced above person (Moskal 2015; Smith et al. 2016; Harbour 2016). A way of doing this is to propose that number and person information may escape deletion through head movement of Num or n up to K. In this view, Num in Dinka would move up to K, so that a copied pronoun always realizes the complex head Num+K. This approach derives the generalization in (64) from the Head Movement Constraint (Travis 1984), since n cannot move up to K without skipping Num. A limitation of the approach just outlined is that it requires positing variation in head movement operations across languages that are hard to diagnose on independent grounds. As a result, I will set aside this option here, and explore a different approach, in which partial deletion permits more than just the KP layer to survive. It is important to note, however, that the KP-layer approach outlined above will also capture all of the patterns that I discuss in the rest of the paper (with the possible exception of the pronoun gap discussed in Sect. 5.2). Another way of allowing number information to survive deletion is to limit partial deletion, so that the NumP layer in fact also survives partial deletion. The idea that Num survives deletion would trivially explain why all pronoun copying constructions discussed in this paper preserve number information. To allow for the NumP layer to escape partial deletion, I propose that partial deletion is not unfettered, but is restricted to phasal domains (65).35 This idea will end up restricting partial deletion in DPs to deletion of nP, allowing number information to remain. To make the constraint in (65) compatible with deletion of full copies, I adopt the idea that the highest head in an extended projection is always a phase head, as in a dynamic conception of phases (e.g. Bobaljik and Wurmbrand 2005; Bošković 2014). In cases of phrasal movement with a spell-out of a single copy, this assumption means that the effects of (65) are indistinguishable from full copy deletion, because a full copy necessarily corresponds to a phase. The most important consequence of (65) for present purposes is that it restricts partial deletion. Specifically, (65) predicts that partial deletion is only possible if the copy to be spelled out involves a phasal boundary within it. Let us consider how this applies to a DP copy. I propose that both K and n are phase heads, so that there are two phases in every lexical DP.37 This idea gives us one legitimate option for partial deletion within a DP, namely deletion of nP, which is also a phasal unit. After deletion of nP, the structure that is left behind consists of K, and Num (66). My proposal then is that (66) is always the form of a copy of a lexical DP in the context of multiple copy spell-out. This is the structure I suggest is behind all instances of pronoun copying I discuss in this paper. Importantly, however, (66) is not fully identical to a pronoun, since n is absent. As a result, the structure in (66) can yield pronoun copying, but only if there are pronouns that can realize a structure containing just K and Num. In other words, (66) requires 3rd person pronouns that are realizations of number, a property that I will suggest varies across and within pronoun inventories. This limiting factor then will be behind the number asymmetries in ké-copying, and also behind variation across pronoun copying patterns. The structure in (66) will always produce copied pronouns that preserve number and case, which I argue in Sect. 5 is a correct result. However, it allows for a different result when it comes to person. Specifically, if person is encoded on nP in pronouns, it will also undergo partial deletion when the input to multiple spell-out is a 1st or 2nd person pronoun. This will produce the person mismatch in Dinka, and in other languages. As we will see in Sect. 5.1, languages vary in this dimension, however. Copied pronouns may also match in person. I will suggest that this is because of a 2nd parameter of variation, whether n is a phase in pronouns. Given the constraint on partial deletion adopted above, this will also lead to variation in pronoun copying. One question that arises for this nP deletion view is what happens to dependents of the noun, such as adjectives or possessors. Note, however, that Economy of Pronunciation actually forces deletion of all such phrasal dependents, on the assumption that these are phasal units as well (something which is forced by a dynamic conception of phases). Before demonstrating how this approach delivers the properties of ké-copying, let me briefly discuss one potentially problematic consequence of the idea that copy deletion is limited to phases. Importantly, this idea is incompatible with traditional head movement, because the copy left by head movement will usually not correspond a phase. As a result, all head movement should result in copying constructions. One aspect of this that is encouraging is that Ā-movement of heads does very frequently lead to multiple copy spell-out.38 But something must exempt traditional head movement from the effects of (65). One possibility, which I will adopt here for the sake of clarity, is that such head movement effects are not achieved by syntactic movement, but rather reflect morphophonological operations (e.g. Brody 2000; Hale and Keyser 2002; Harley 2004; Adger 2013; Hall 2015). The approach to multiple copy spell-out developed here does not build in any fundamental asymmetry between nouns and verbs, except in that movement of a noun by itself is not commonly found. Noun copying should then be possible if a noun moves out a more complex DP by itself. In fact, Trinh (2011) shows that, in Vietnamese, a noun can be topicalized while stranding the rest of the DP, including numerals and classifiers. In such instances, the lower copy of the noun may undergo multiple copy spell-out (67a–b). This is evidence that nothing in principle rules out noun copying, and that pronoun copying is a by-product only of multiple spell-out with phrasal movement. Conversely, if verb copying and pronoun copying arise by the same mechanisms, we should be able to find instances of phrasal movement with verbs that leave a “pronominal” copy, or an auxiliary. Källgren and Prince (1989) show that Swedish VP-fronting fits this description. In Swedish, a verb phrase containing the finite verb can be fronted. In such constructions, the auxiliary göra (‘do’) must appear in the gap position (68a–b), which cannot occur with the lexical verb without fronting (68c). Importantly, the finite verb and the auxiliary must both express tense morphology. Källgren and Prince defend an analysis exactly analogous to the one proposed here for pronoun copying: the auxiliary acts as a “lexically realized trace” of VP-movement. This is further evidence that the apparent asymmetry between pronoun copying and verb copying is just about the structures of the copies that are left behind by movement and does not reflect an intrinsic difference between verbs and nouns. Let me now turn to ké-copying, and how this model of pronoun copying derives the number asymmetries that are particular to Dinka. In Sect. 5, I show that these asymmetries have their counterparts in other pronoun copying constructions as well, and demonstrate that variation across pronoun copying patterns can be captured given the parameters of variation I have identified here. The economy approach to copy deletion outlined above means that pronoun copying involves partial deletion, specifically of nP. In this section, I show how, given the assumptions about Dinka pronouns defended in Sect. 3.3, this proposal derives the key properties of ké-copying. I will start with the asymmetry between singular and plural. Consider the derivation of an example with ké-copying. In (69), the plural object Open image in new window (‘giraffes’) is topicalized out of the vP, and the intermediate copy in Spec-vP is realized as ké. The derivation of (69) is represented in (70). In the vP phase, the object Open image in new window moves to Spec-vP, as a result of an Agree relation with a φ-probe and Ā-probe on v, both with an EPP subfeature. The object is subsequently attracted to Spec-CP, by probes on C.
As proposed in the previous section, Economy of Pronunciation and P-Recoverability constrain the mapping to PF.39 Let’s consider their effects on each copy. No unique PF requirement is associated with the complement of V position and its phonetic content is realized elsewhere, and so it undergoes full deletion. However, both the V2 property of v, represented by the EPP subfeatures of its probes, and the V2 property of C function as unique PF requirements. This means both higher copies must be realized, resulting in multiple copy spell-out. However, as outlined in the previous section, P-Recoverability permits partial deletion of one copy, and so this is forced by Economy of Pronunciation. One KP copy will undergo partial deletion. Since deletion is limited to phases, the only legitimate partial deletion option is to fail to realize the nP phase within one of the KP copies. As a result, deletion of nP applies to the copy in Spec-vP, as in (71). Note that nothing guarantees that it is the highest copy, in Spec-CP, which undergoes full spell-out. In fact, I suggest that languages vary parametrically in which copy undergoes partial deletion. As we will see in Sect. 5, there are pronoun copying constructions in which it is the highest copy that is reduced to a pronoun. Let us focus now on how the copy in Spec-vP comes to be realized as a pronoun. The structure that remains after deletion, K and Num, is shared with pronouns, and looks exactly like the structure I suggested for the 3rd person plural pronouns ké(ek). Importantly, the spell-out rules responsible for the realization of plural in Open image in new window in the usual case are bled by deletion. Since plural marking on nouns is irregular, as described in Sect. 3.2, we can take these insertion rules to look something like (72). This proposal also explains the absence of pronoun copying with singular DPs. Suppose the topicalized copy is singular, like the DP mìir (‘giraffe’). Partial deletion applies to the copy in Spec-vP in the same fashion as above, leaving K and a singular Num, as represented in (73). The insertion rules I posited for Dinka pronouns, however, cannot create a pronoun from this structure. The relevant rules are repeated in (74). Let me now turn to the absence of person features on copied ké, as in examples like (75). An nP deletion approach also explains why copied ké does not match its antecedent in person. As suggested in Sect. 3.3, the structure of a copy of the 2nd person plural pronoun is in (76). I propose that the projection that contributes the person root, nP, is phasal, so that it undergoes partial deletion also. The resulting structure is again identical to the structure of a 3rd person plural pronoun and so surfaces as ké(ek), just as with lexical DPs. Since person is contributed by n, it is absent on the copied pronoun. Unlike with lexical DPs, I propose that whether n is a phase in pronouns varies across languages. In Dinka, n is always a phase, but I will argue that, in other languages, the phasal status of n varies according to whether it takes a root complement. In languages in which n is not phasal in pronouns, copied pronouns will match in person as well as number. I examine this dimension of variation in detail in Sect. 5.1, where I also suggest an independent diagnostic for the phasehood of n in pronouns. To recap this section, we have seen that analyzing ké-copying as partial deletion explains both the gap with singulars as well as the person mismatch with pronouns. Both follow from the logic of partial deletion. The gap with singulars arises because partial deletion removes too much structure for a pronoun to be created from the remaining parts. The person mismatch results because deletion removes the nP projection that encodes person features. In the rest of the paper, I show that this model provides a unified account of pronoun copying constructions, including resumption, wh-copying, and subject doubling, and can account for variation across these constructions. This fact is surprising if we adopt a phonological approach to the EPP, so that the EPP property of a feature functions as a spell-out instruction (e.g. Richards 2001, 2016; Boeckx 2003; Landau 2007). The V2 requirement of C should function as a unique PF requirement from the perspective of P-Recoverability, just like the V2 property of v. Richards (2001) and Boeckx (2003) point out, however, that languages may adopt several strategies to facilitate copy deletion in an EPP position. One is multiple copy spell-out. Another is the phenomenon of anti-agreement, in which agreement triggered in the EPP position is either deleted or impoverished in the context of extraction. I will now show that we can tie the absence of ké-copying at C to an anti-agreement effect. Although C and v both have the V2 property in Dinka, an independent difference between the two is that C hosts agreement in person and number with the nominal that moves through its edge, on a prefix called the declarative/interrogative particle (see also Sect. 3.2). Interestingly, although this prefix usually expresses both the person and number feature of the DP in Spec-CP, in the context of extraction an anti-agreement effect obtains. As evident in the examples of long-distance relativization and topicalization in (78a–b), intermediate C only shows agreement in number and not in person (see also the paradigms in Sect. 3.2). The presence of this anti-agreement effect is an independent difference between the edge of the clause and the edge of the verb phrase, where no overt agreement is ever found. Following Richards (2001), I suggest that anti-agreement is one way to resolve the problem posed by movement out of an EPP position, by deleting the features that require spell-out. Concretely, I propose that Impoverishment rules may delete the feature that requires spell-out, along with its EPP subfeature, at PF (see Baier 2016).46 If Impoverishment applies before copy deletion, then anti-agreement can pre-empt multiple copy spell-out in this fashion. In support of this, note that Nupe and Vata, languages in which an overt pronoun must accompany subject extraction, both lack subject-verb agreement. This makes sense if pronoun copying is necessary when an anti-agreement effect does not obtain. The above discussion suggests that there are likely Dinka-internal reasons why ké-copying is only necessary at the vP edge. However, it is worth noting that we have not seen any reason to think it is not possible for a language to display multiple copy spell-out at both the CP and vP edge. At the same time, in the model of multiple copy spell-out advocated here, we can see why such a system would be rare. Such a system is only possible if both the CP and vP edge display something like the EPP property, and such languages are not at all common. It should be clear, for instance, that we do not expect to find pronoun copying at the edge of the verb phrase in a wh-copying language like German: it lacks an obvious EPP position at the vP edge. In this section, I show that the approach to pronoun copying outlined in Sect. 4.1 offers a unified account of pronoun copying constructions. In particular, we will see that similar effects to the featural mismatch and the singular gap found in Dinka are attested in other constructions in which pronouns have been analyzed as realizations of the gap, such as resumption, wh-copying, subject doubling, and clitic doubling (e.g. Zaenen et al. 1981; Koopman 1982, 1984; Sells 1984; Engdahl 1985; Pesetsky 1998; Kandybowicz 2007; Holmberg and Nikanne 2008; Harizanov 2014; Sichel 2014). I demonstrate that we can capture these person mismatches and gaps in the same way and show how a partial deletion model can accommodate variation across pronoun copying constructions. One of the surprising aspects of Dinka ké-copying is that the copied pronoun only matches the antecedent DP in number features and not in person, which I derived from nP deletion. This person mismatch effect is not limited to Dinka, but is in fact more commonly found in pronoun copying constructions. In addition, there are languages in which the copied pronoun does realize person in addition to number. I propose that we can capture this variation if n in some languages is not a phase in pronouns. Kandybowicz (2007) documents a person mismatch effect in Nupe resumption. In Nupe, long-distance subject extraction must leave behind a resumptive pronoun in the lower subject position (79). As in Vata (Koopman 1982; Koopman and Sportiche 1986), this type of resumption patterns like movement. It is island-sensitive, for example, and so is impossible out of a wh-island (80a), or a subject island (80b). At the same time, the copied pronoun does match the antecedent in number. 1st and 2nd person plural pronouns are necessarily resumed by the 3rd person plural (82a–b). As in Dinka then, the copied pronoun has to match the antecedent DP in number features, but surfaces with a default person value when realizing a copy of a pronoun. Note that the absence of pronoun copying with singulars is not found in Nupe. In Nupe, singular number is still matched on a 3rd person singular pronoun. The Nupe facts demonstrate that the number matching pattern is not limited to intermediate copying. We also find this pattern when the pronoun is the realization of the highest copy. Colloquial Finnish allows a subject to be doubled by a clause-initial pronoun (83a–b). Holmberg and Nikanne (2008) analyze this as multiple copy spell-out, because the pronoun may express the case features of the antecedent and behaves like a phrasal DP in terms of its syntactic positioning. As Holmberg and Nikanne point out, the doubled subject need not match in person. Instead, the 3rd person singular may be used to double 1st and 2nd person singular pronouns (84a–b), and, for some speakers, the 3rd person plural pronoun can be used to double 1st and 2nd person plural pronouns (84c–d). Unlike in Dinka or Nupe, this is not obligatory. For all speakers, 1st and 2nd person pronouns may be doubled by an identical initial pronoun as well, as the examples in (85a–b) evidence. Importantly, there is an asymmetry here between person and number. Although mismatches in person are tolerated, matching in number is obligatory. The third person singular, for instance, cannot be used to double any of the plurals, as the examples in (86a–b) show. Similarly, the 1st and 2nd person singular pronouns cannot double their respective plurals (86c–d). That this pattern of person-insensitivity shows up in a wide range of pronoun copying constructions provides evidence that these constructions should be given a unified treatment. The similarities between Finnish, Nupe, and Dinka are striking, given the very different functions that pronoun copying fulfils in all of these languages. In the pronoun copying approach developed above, we can extend the same treatment to these languages. The copied pronoun is a product of nP deletion, which deletes person, and not number. Although not necessarily as morphologically obvious as in Dinka, I propose then that 3rd person pronouns in these languages all have the structure of Dinka ké(ek): they realize only number. In Nupe and Finnish, this is true of the 3rd person singular pronouns as well, so that they lack the singular gap. In other words, I posit that Nupe u: and Finnish se have the structure in (87). As a result, pronoun copying will always deliver an overt result, unlike in Dinka, but never one that matches in person. This pattern is then minimally different from the Nupe one, but with matching in person also. There is similar variation in pronoun spell-out of intermediate copies. We can compare Dinka to Seereer, which displays a strikingly similar pronoun copying pattern at the CP edge (Baier 2014). In Seereer, copied pronouns accompany movement across a clause boundary. Copied pronouns appear immediately after the complementizer (89a–b). Pronoun copying in Seereer targets a different domain edge (the edge of CP) and does not show a gap, as the examples above attest. Seereer pronoun copying is similar to ké-copying in many respects, however. Like ké-copying, it is an obligatory reflex of long-distance movement. In addition, as Baier shows, Seereer pronoun copying is movement-derived. Movement with copied pronouns is island-sensitive and so cannot cross a wh-island, for example (90). As in Dinka, movement with pronoun copying may reconstruct. The examples in (91a–b) illustrate that these dependencies may reconstruct for long-distance (91a), and intermediate binding (91b). Unlike in Dinka, copied pronouns in Seereer match fully, so that 1st and 2nd person pronouns are doubled by identical pronouns, as in (92), for example. In all copying configurations then, we find languages with matching for number only and languages with full matching. To understand this variation in pronoun copying patterns, I propose that languages may vary as to whether the n head found at the core of a pronoun is a phase head, like its counterpart in lexical DPs. In languages in which a copied pronoun matches in person, the intransitive version of n found in pronouns is not phasal. This means that languages fall in two categories. In languages like Dinka, Nupe, and Finnish, pronouns contain two phasal boundaries (93). But, in Seereer and Yoruba, pronouns just have one phasal boundary, KP (94). If nP is not a phasal unit in a pronoun, as in (94), then multiple copy spell-out of a pronoun will not allow any partial deletion, as per the logic of deletion outlined in Sect. 4.1. As a result, a fully matching copy must surface. Since n is still a phase in lexical DPs, no differences should be found there. This approach also straightforwardly derives the absence of pronoun copying that matches only in person. As long as person is always below number, partial deletion does not yield this option. Although Economy of Pronunciation guarantees one outcome at PF, we can model variation within the grammar of a single speaker in this dimension as well, such as the optional number mismatches allowed by Finnish speakers. Speakers that allow an optional mismatch would vary in whether n is a phase head (resulting in number matching) or not (resulting in full matching). One question is whether we can find independent differences between pronouns across languages that support the phasal distinction I posit in (94). Suppletion patterns might provide one such diagnostic. Moskal (2015) shows that pronouns and nouns differ crosslinguistically in the suppletion patterns they allow. Pronouns commonly supplete both for plural and case. Nouns, however, supplete only for number for the most part. In Dinka, for example, the plurals for mòc (‘man’) and tìik (‘woman’) are suppletive (95). Moskal (2015) presents an account of this difference between pronouns and lexical DPs that makes crucial use of the idea that the nP phase is missing in pronouns. To be precise, she proposes that, because n is a phase head, case features end up not sufficiently local to a noun root to trigger suppletion (see also Embick 2010; Bobaljik 2012). However, in Smith et al.’s (2016) survey of suppletion patterns, pronouns fail to supplete for case in 76 out of 160 languages in their sample (47.5%). Suppose then that these are languages in which n does project a phase boundary, so that pronouns behave like nouns with regard to suppletion. This makes the prediction that languages with number matching only should not show suppletion for case, which seems to be borne out at least in the sample of languages considered here. In Dinka, pronouns only supplete for number and, like other nouns, mark case only by differences in tonal contour. Nupe lacks case marking and so vacuously satisfies this prediction. Finnish is also compatible with this prediction, because its pronouns are non-suppletive, as evident in the paradigms for 1st and 2nd person pronouns given in (96). Although the languages with full matching discussed here (Seereer and Yoruba) lack case, suppletion could then potentially serve as an independent diagnostic for the phasal distinction proposed above. Having established that there is a person-number asymmetry in the behavior of pronoun copying across languages, I now turn to the second asymmetry evident in pronoun copying in Dinka, the gap with singulars. In this section, I point out two comparable gaps in other pronoun copying constructions, in which a subset of antecedent DPs fail to trigger pronoun copying. I show that these gaps too follow from the idea that partial deletion may delete too much of a DP copy, so that no copied pronoun can be created. Another gap sensitive to the φ-features of the antecedent DP is found in German wh-copying, as described by Pankau (2013). Pankau (2013:ch. 3) shows that wh-copying in German requires matching both in case and φ-features. Copied wh-phrases always carry the same case as the full DP (97a–c). Whether wh-copying involves matching in φ-features also is harder to investigate, because wh-pronominals are necessarily 3rd person and, as Pankau points out, only have a masculine and a neuter form in German. The paradigm for German wh-pronouns is given in (98). Using this paradigm, all we appear to be able to determine is that a copied wh-pronoun must match a higher masculine wh-phrase in gender, as in (99). However, as Pankau shows, an interesting pattern emerges with complex wh-phrases, for speakers that allow copying. A conflict arises with complex wh-phrases that are feminine or plural. The copied wh-pronoun should agree in gender and number, but there is no agreeing pronoun in (98). The result is that wh-copying is obligatorily absent, as the examples in (100a–b) attest for extraction of a singular feminine. There is another gap that often appears in pronoun copying, commonly attested in wh-copying constructions. Many researchers working on wh-copying have noted that, for many speakers, wh-copying is limited to wh-pronominals (e.g. Fanselow and Mahajan 2000:220–221; Felser 2004:550; Pankau 2013:46–47). Such speakers allow (101a), but disallow copying with complex wh-phrases (101b–c). Van Craenenbroeck and Van Koppen (2002) show that similar variation exists across dialects of Dutch with regard to subject doubling constructions. In Wambeek Dutch, both complex and pronominal subjects can be doubled by a pronoun (102a–b). In these pronoun copying constructions then, a gap arises with complex wh-phrases. Multiple copy spell-out is only possible if both DPs are pronouns. This gap is in fact neatly predicted by the model developed so far. German and Dutch have suppletion for case in pronouns, so are systems in which n cannot be a phase head in pronouns. Suppose now that, for some speakers, all 3rd person pronouns are treated as realizations of both person and number, as I argued for the 3rd person singular pronoun in Dinka. As for Dinka, we could say that this is because the insertion rules for the 3rd person pronouns for these speakers all make reference to person.52 This would mean that partial deletion in a lexical DP will never result in a structure that can be realized as a pronoun, because none of the 3rd person pronouns realize only number. When the moved DP is a pronoun, however, no partial deletion applies (n is not a phase), so that multiple copy spell-out does yield a pronoun. This section has shown that the person mismatch and the singular gap in Dinka have their counterparts in other pronoun copying constructions, so that the effect of partial deletion is evident across languages. This provides evidence for a unified account of multiple copy spell-out, based on subdeletion, with two parameters of variation: (i) the spell-out rules responsible for creating pronouns, and (ii) whether n in pronouns is a phase. In this paper, I have develop a unified approach to pronoun copying constructions, based on an economy approach to copy deletion (Landau 2006). I demonstrated that copied pronouns display asymmetries and gaps, in a way that reveals the application of partial deletion, so that pronouns that spell out copies show identifiable morphosyntactic differences from ‘trueborn’ pronouns. If correct, then the syntax of gaps left by movement is not as opaque as sometimes thought. The internal structure of gaps becomes transparent in a range of syntactic contexts and offers direct insight into the structure of DPs, providing evidence that all displacement of DPs involves the formation of copies with an articulated internal structure, as in the Copy Theory of Movement (Chomsky 1995 et seq.). Also, ké-copying functions as an additional argument for successive-cyclic derivations, because it provides evidence for a step of intermediate movement through the vP edge (Chomsky 1986 et seq.). Finally, the approach to pronoun copying defended here shows that person and number are introduced in separate projections within a DP, because they can be separated in copying constructions. I will be not making a distinction here between copy formation and multidominant structures, though see Johnson (2012) for some discussion of how this distinction could be relevant to multiple copy spell-out. Abbreviations for Dinka: 1/2/3 = 1st/2nd/3rd person, assoc = associative plural, c = complementizer, cs = construct state, d = declarative, fut = future, gen = genitive, int = interrogative, neg = negation, nf = non-finite, oblv = Oblique Voice, ov = Object Voice, p = preposition, p/pl = plural, pass = passive, prf = perfect, pst = past, s/sg = singular, sv = Subject Voice. This is accompanied by a change in case marking of the subject, because Dinka has an Austronesian-style voice system. This is not relevant for the Dinka facts we will be discussing, but see Van Urk (2015) for extensive analysis of voice and case in Dinka. Dinka has a wide range of auxiliaries to express meanings associated with adverbs in other languages. See Andersen (2007) for an overview. Since vP-level V2 in Dinka ignores subjects, I have omitted the subject. We can assume either that the subject occupies a different specifier of v that never interacts with V2 (presumably because v and the subject do not enter into an Agree relation), or that vP represents a domain below where the subject is generated. To explain why intermediate movement must satisfy V2 in Dinka, Van Urk and Richards (2015) adopt an economy condition, Multitasking, that forces all probes on a head to target the same goal if possible. Similar effects are found at the CP edge. I discuss these in Sect. 4.4, which addresses the question of why there is no pronoun copying at the clause edge. See Van Urk (2015) for a description of the various types of long-distance movement in Dinka. This pattern cares only about grammatical plurality of the moving DP. Ké-copying is required regardless of whether single or multiple events are described. There may be some variation across speakers in this respect. The two Dinka speakers I worked with consistently require it, but ké-copying is described as optional for the Agar dialect by Andersen (1991:276–277). See fn. 46 for suggestions on how to handle speakers for whom ké-copying is optional. Note also that Andersen’s two examples of ké-copying contain the short form ké. The only way in which some roots are bigger than kêek is that some roots contain a superlong vowel. In Dinka Bor, extraction of modifiers is usually accompanied by the Oblique Voice form of the verb. As evident in these examples, auxiliaries may optionally lack this marking, surfacing in the Object Voice form instead. See Van Urk (2015:ch. 3, Sect. 2.5) for description and discussion. These facts seem to show that at least PPs that contain a lexical noun must be generated inside vP in Dinka. This could be taken to be related to the fact that all moved phrases have to become nominal, as described in Van Urk (2015). Specifically, we could take this as evidence that what appear to be modifiers actually must be generated as nominals in a high applicative construction to be able to be extracted. This would also explain how the preposition comes to be omitted. See Van Urk (2015) for more discussion. This pair of examples also shows that Dinka allows extraction out of an extraposed clausal subject. Note that Dinka generally allows extraction out of extraposed clauses (see also Van Urk and Richards 2015). It is important here that reconstruction effects co-occur with island-sensitivity, since Guilliot and Malkawi (2006) have shown that there is a class of resumptive pronouns, such as weak pronouns in Jordanese Arabic, that display apparent reconstruction effects in islands, through a mechanism of NP deletion. For this reason, reconstruction is only a reliable diagnostic for movement if it co-occurs with island-sensitivity. Note that topicalization of the anaphor is only possible if it is accompanied by a pronominal possessor co-indexed with the antecedent. It is also possible to use the anaphor without a possessor in the base position, but then topicalization is impossible. Note that some speakers must have a resumptive pronoun th Open image in new window n (‘in it’, roughly) in (31a). An interesting question is why copied ké must reside in the outer specifier. For the sake of concreteness, we can attribute this to the order in which the different probes on v are activated. Note that the plural morpheme kè is an affix, and not a clitic, even though it shows similarities to the 3rd person plural pronoun. Unlike copied ké, it appears between the clause type/tense prefix and its host. Second, it is restricted to the past tense and so displays tense-variance (Nevins 2011). Finally, unlike copied ké, it does not alternate between a reduced and full pronominal form. Because of this, I have opted for a simplified monomorphemic gloss throughout (like ‘love.1pl’ in (44b)). Note that the alternation between k and ke may actually be fully determined by the surrounding syllable structure. The allomorph ke appears in subject enclitics and as part of the declarative/interrogative particles. The plural enclitics cannot be k, because this would create an illegal complex coda (Dinka verbs all end in a single coda consonant). I propose that ke appears in the paradigms for the declarative/interrogative particles because affixes in Dinka do not permit a coda consonant, as previously noted. As a result, the initial k must be the onset, so that the plural morpheme must be a separate syllable. An alternative would be to say that there is a null elsewhere form for singular. Nothing hinges on this for the proposal I will develop. See Gruber (2013) for an explicit proposal of what the semantic content of a person phrase at the core of a pronoun might be. From the perspective of suppletion, what is important about the structure in (50) is that both K and Num are sufficiently local to the pronoun root to allow pronouns to display suppletion for case and number. In contrast, Moskal proposes that the root of a lexical DPs is below a phasal n and so is too far removed from K to supplete for case. Where morphemes of both number and case are present and both follow or both precede the noun base, the expression of number always comes between the noun base and the expression of case. I omit tones, which I assume come from the spell-out rules for case morphology. It is also possible that the absolutive contour is underlying or default, particularly if unmarked case is taken to reflect the absence of case. As Andersen (1993) shows, Dinka productively places templatic restrictions of this kind to create morphological alternations. The non-finite form of a transitive verb, for example, is like the full form of the pronoun in that it must have a coda and always lengthens the vowel from the unmarked form. I assume then that the short and full form of the pronoun are formed from the same syntactic structure. In the short form, the final consonant marking number undergoes deletion in order to fit a CV template. The definition of P-Recoverability means that there must be some way of distinguishing copies from independent reuse of the same lexical item in order to identify whether two phrases are part of the same chain, for example by means of numeration indices (Chomsky 1995). Importantly, this approach requires that copies of the same item be viewed as syntactic objects that can be manipulated independently, at least at PF. This may be incompatible with some versions of a multidominant approach to movement. It is also necessary for there to be a phonological requirement associated with the higher copy, because otherwise Economy of Pronunciation will deliver covert movement. Tying the PF requirement to the EPP property of a feature allows us to explain the observation that ké-copying is still necessary when there is a V3 structure at the vP edge, as in examples like (33). In principle, a linearization-based approach might be augmented with a partial deletion mechanism and deliver some of the same results (see, for example, Baker and Kramer 2016). Such an approach must still face the issue that there are multiple copy spell-out patterns which do not obviously involve cliticization. The proposal that copy deletion aims to delete as much as possible seems similar to the idea that ellipsis is constrained by MaxElide (Takahashi and Fox 2005; Merchant 2008; Hartman 2011). If constraints on ellipsis correspond closely to constraints on deletion, as Landau (2006) suggests, Economy of Pronunciation and MaxElide could perhaps be viewed as the same constraint, modulo the role of Parallelism domains. This is reminiscent of the idea that ellipsis domains correspond to phasal domains, although it is important here that the phase head is deleted along with the rest of the phase. Alternatively, this could be seen as a constraint on recoverability. One possible way of understanding this claim is as the idea that deletion amounts to non-Transfer, if we assume that Transfer applies to an entire phase, as in the linearization-based view of successive cyclicity in Fox and Pesetsky (2005), for example. Equating deletion with non-Transfer does raise questions about the timing of copy deletion, and exactly when Transfer occurs. See also fn. 39. See Bošković (2015) for a recent defense of the idea that there are two phasal domains in the DP. This observation led Trinh (2011) to posit a constraint on copy deletion with Ā-movement of heads that is very similar to what I suggest here. In particular, Trinh proposes that copies left by head movement can only be deleted in they are final in a phrase (i.e. not followed by an object), based on contrasts between VO/OV languages and differences between transitives and intransitives. For the cases he discusses, we can effectively re-interpret this as the idea that copies of heads can only delete if they are the only element in a phase. It is important that copy deletion is ordered before Vocabulary Insertion. This may have consequences for our assumptions about how much structure is visible at PF (e.g. Embick 2010), since it must be the case then that, when copy deletion takes place, at least enough syntactic structure is accessible to evaluate the fate of a copy. Note that it must hold in general of the spell-out rules that create morphology specific to nominals that they require the presence of a noun if pronouns are treated as DPs without a noun. As noted in Sect. 3.3, I assume the same derivation produces the full and the reduced form, the only difference residing in the templatic restrictions placed on the pronoun. Note that all phrasal dependents of the noun, like higher adjectives, numerals, possessors and perhaps also some quantifiers, must also undergo partial deletion, even if they are attached above the nP level. This is forced by Economy of Pronunciation, on the assumption that all such phrases are phasal. Another theoretical option, however, is to say that the null spell-out represents the elsewhere form. An alternative analytical option could be to say that the rule does apply, yielding the affix -n, but that this affix undergoes subsequent deletion, because it is stranded. In this view, what would distinguish the plural is only that a well-formed pronoun can be created from just the Number head. Note that V2 in embedded clauses may be accompanied by some complementizers. I assume that Dinka has an articulated C domain, in which V2 is established at the lowest head. See Van Urk (2015) for more discussion. This idea also allows us to accommodate speakers for whom ké-copying is optional. We can assume that these speakers extend the Impoverishment rule to include v, even in the absence of overt evidence for anti-agreement. Alternatively, there may just be differences in their representation of the pronoun ké(ek). Adesola observes that it is also possible to leave an expletive in the subject position, which, in Yoruba, is the 3rd person singular pronoun. This could also be analyzed as a “bare resumptive” in the sense of Adger (2011). More evidence for this comes from Pankau’s observation that speakers who allow relative pronouns in wh-copying may employ these instead, since they do come in matching feminine and plural forms. Importantly, this means that a form like wer carries a [+masculine] feature that is not interpreted (because wh-questions using wer are not restricted to men). This idea receives independent support from the fact that pronouns bound by a wh-phrase must also be masculine in form, as Fanselow et al. (2005) point out, even though no semantic restriction to men is present (ia). Conversely, grammatically feminine pronouns cannot be bound by a wh-phrase (ib). One question is why copied pronouns in wh-copying retain wh-morphology, something that is not found in many other pronoun copying constructions. This is presumably linked to the observation that wh-copying is typically restricted to wh-movement, unlike ké-copying, for example. One option is that wh-morphology is in principle deletable (perhaps because it is phrasal in origin), but that wh-copying is driven by the need to express this morphology. As Van Craenenbroeck and Van Koppen note, interesting differences emerge between the strong and weak pronouns in pronoun copying too. The copied pronoun is always strong, while dialects vary as to whether the antecedent can be. I hope that this variation could also be made to follow from a partial spell-out approach. An alternative analytical option, since pronouns in German and Dutch does not show distinct morphemes for person and number in pronouns, like Dinka, would be to say that all pronouns realize person and number jointly, with one morpheme spelling out both NumP and nP. This option is available if we adopt the idea that morphemes can spell out multiple heads, through phrasal spell-out or spanning (e.g. Starke 2009; Ramchand 2008; Bye and Svenonius 2012). Another reason to think a head-adjunction analysis of certain pronoun copying constructions should not be ruled out may be that it can provide an account of specificity restrictions found in some apparent instances of pronoun copying. For example, it has been argued that clitic doubling may represent another construction in which a pronoun can realize a copy of a lexical DP (e.g. Harizanov 2014; Kramer 2014). However, clitic doubling often shows sensitivity to specificity, unlike the other pronoun copying patterns discussed here. Baker and Kramer (2016) present an analysis of this fact based on the idea that clitic doubling involves a reduced copy that is interpreted as a pronoun at LF. See also Bianchi (2011). My thanks to David Hall, Claire Halpert, Sabine Iatridou, Ted Levin, David Pesetsky, Ezer Rasin, and Norvin Richards for comments and discussion, as well as audiences at WCCFL 33 and LAGB 2015, and of talks at MIT, Queen Mary, and Oxford. I am particularly grateful to Nico Baier for extensive conversations about the patterns discussed here. I am indebted to Mangok Bol and Abiar Makoor Guɔt for sharing their language with me. This research is made possible by an NSF Dissertation Improvement Grant, BCS-1440427. Smith, Peter, Beata Moskal, Ting Xu, Jungmin Kang, and Jonathan Bobaljik. 2016. Case and number suppletion in pronouns. Ms., University of Connecticut, Washington University in St. Louis. Available at https://ling.auf.net/lingbuzz/003110. Accessed 19 September 2017.